You know how it starts. 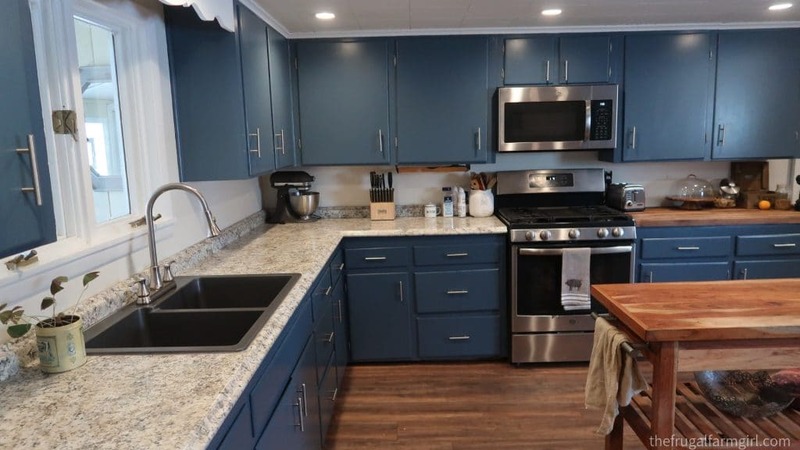 You ask your husband what he thinks about a blue color on the cabinets? He gives you a look, like he really doesn’t care, but he’s wondering how involved he is going to be. My husband and I both agreed our kitchen was outdated and not our favorite. 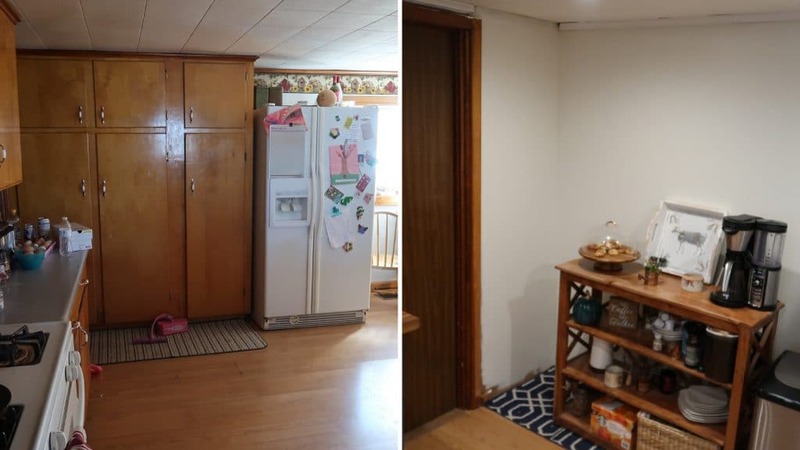 Yet, our kitchen is huge. A true old fashion 1850’s farm kitchen. Okay the decor was more 90’s but our house was built forever ago. There were so many other things we wanted to tackle before the kitchen. 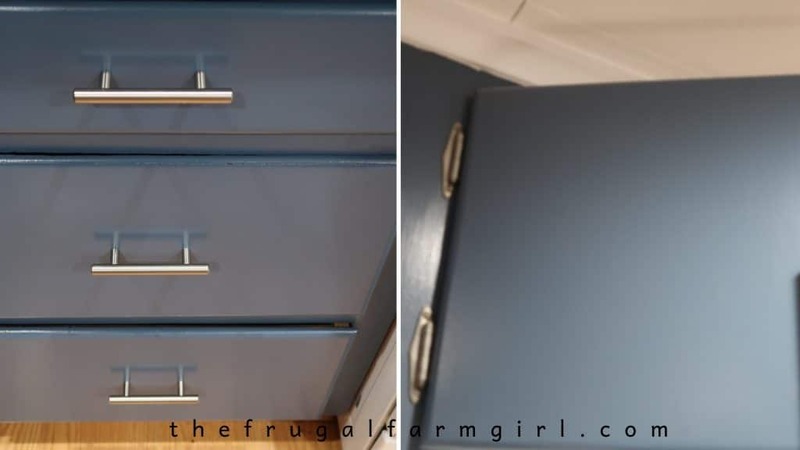 After three years I decided it would be a good time to paint the cabinets while my husband built a new barn. That’s how we are. Hyper, go- getters and we always need a project. 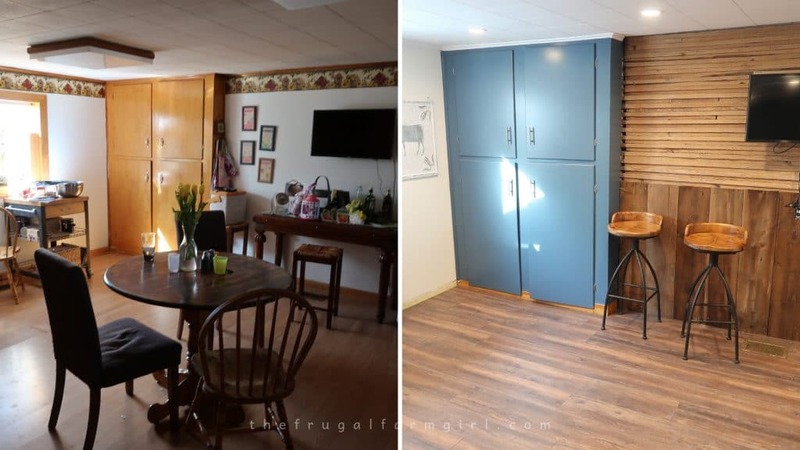 The thing is I didn’t really consider just painting the cupboards until I was flipping through a magazine and saw a beautiful blue I knew was the one. 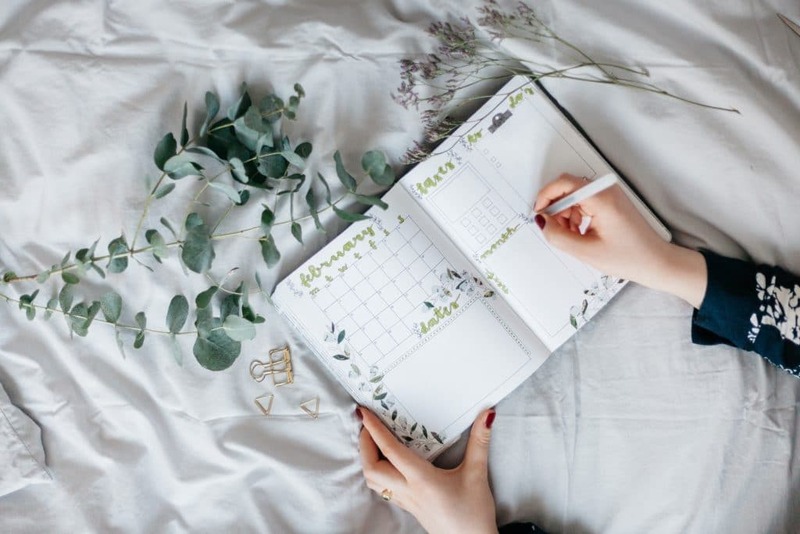 If you are new to our blog, we are a very frugal couple. We really don’t like spending a lot of money on stuff if we don’t have to. 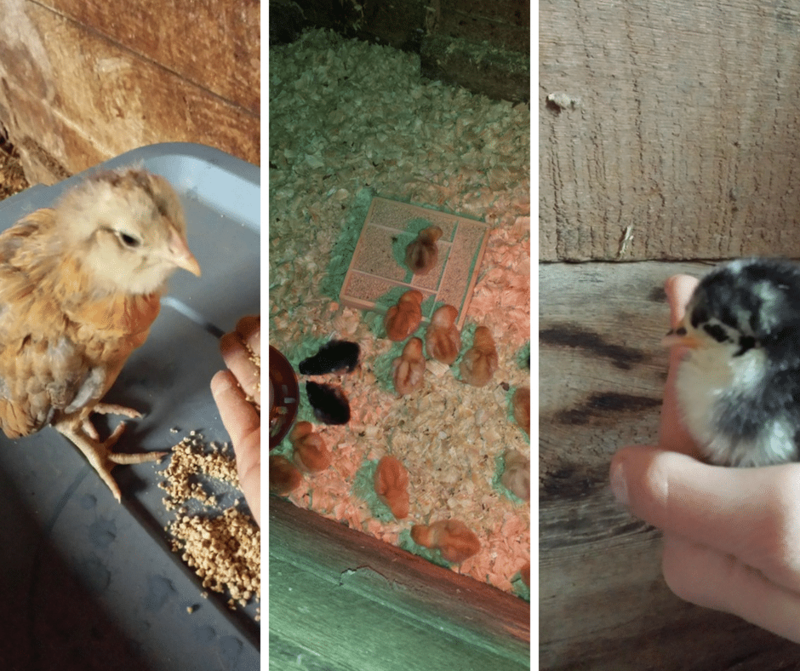 We’ve paid off all our debt, working on the mortgage and built our barn debt free. We completely DIYed every single room in our first house. 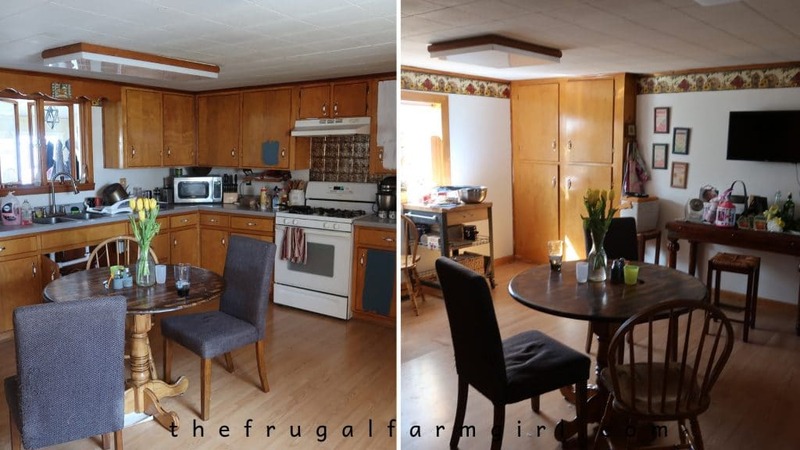 In our new adventure this farmhouse we plan to do all the projects ourselves. TIME. I knew I could do this project myself. Something came over me I needed to get rid of the oak color and bring in that blue I fell in love with. We did a few other minor changes that I’ll share below. The ceiling lights were horrible. Not only in looks but the amount of light it provided. When the ceilings are low you definetaly need good lighting. Adding different lighting to a room can givee it a big change for a little cost. 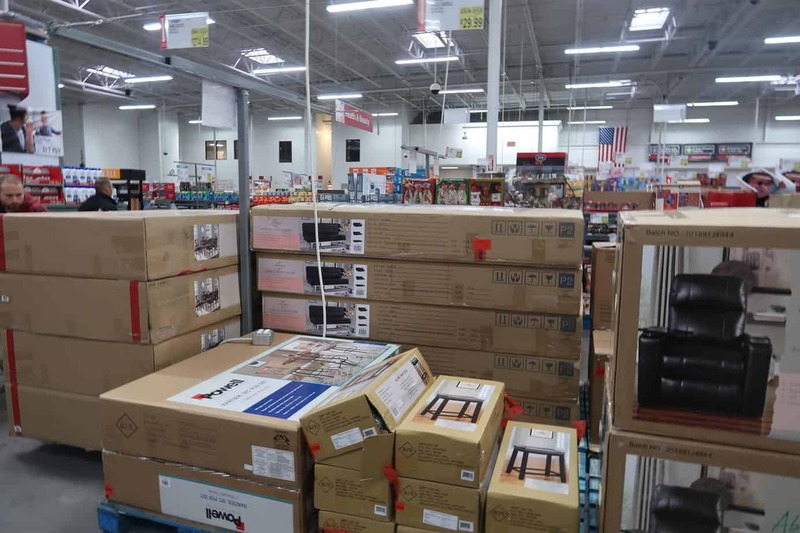 We were able to get recessed lighting kits on sale at BJs Wholesale club. Since I am a blogger over at Mybjswholesale I’m always on top of all the deals. I wish they still offered these lights. 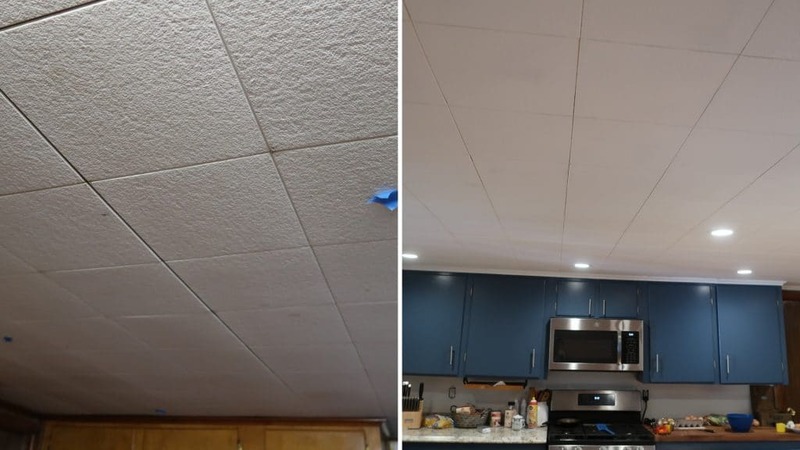 I painted over the ceiling tiles with a standard ceiling white paint. I used an entire gallon of paint. These tiles really soak in the paint. We demoed a couple things I wasn’t planning on. The big cabinet in the back corner wasn’t even attached. 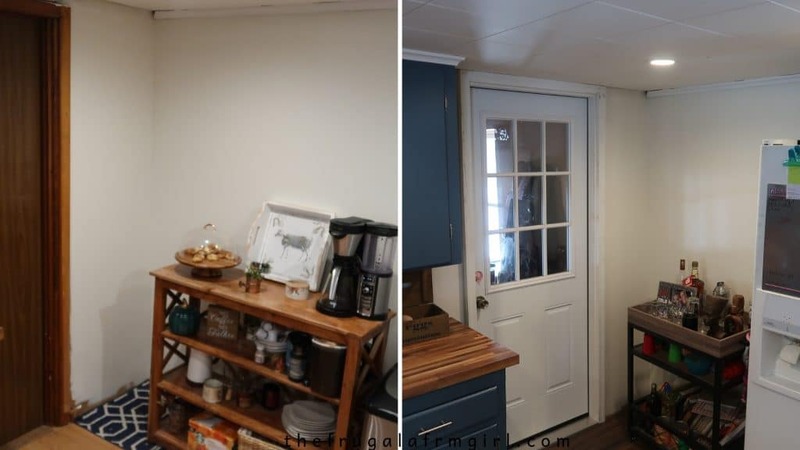 We had a narrow hollow door that went from the kitchen to the garage. You could see light coming through the door which means we were losing a lot of heat in the winter. 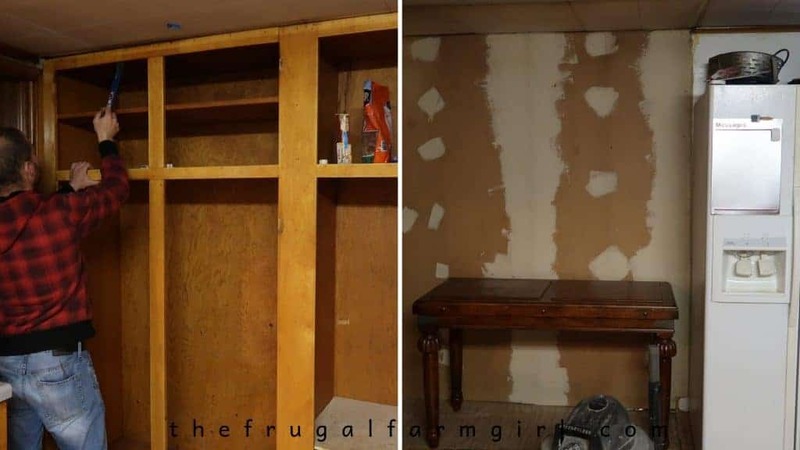 To expand that wall to get a regular size door I thought it would be better to get rid of the bulky cabinet. The only thing I was storing in it was garbage and a broom. We added an exterior door and the window brings in more natural light to what used to be a dark corner. Now we just have to hope we get woodwork up soon! We found a unique feature in our home when we tore out the carpet on our stairs, some of our walls are stacked wooden walls. My husband had a feeling this kitchen wall was stacked. 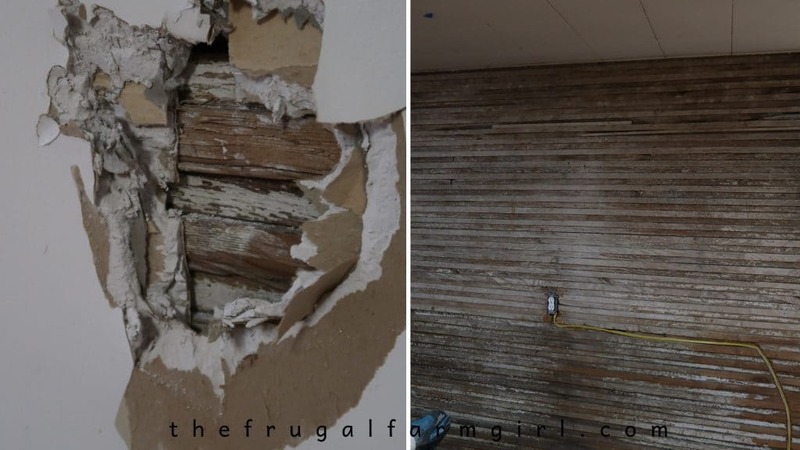 I love the shiplap look but this is awesome, unique and FREE so I told him take down the drywall. This wall took a lot of scrubbing with a wire brush. We are guessing this was the exterior wall long ago. Our house was built in 1850. 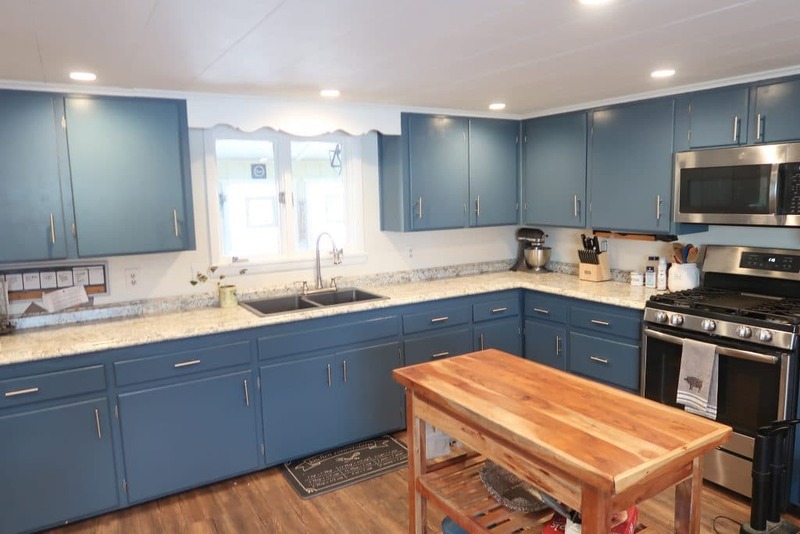 I decided to paint the cabinets a deep blue. It was originally a Benjamin Moore color I grabbed out of a magazine. I took it to Home Depot and had them color match it. They type the name in and I got the same thing for cheaper. We chose the Behr Paint and Primer in semigloss. The paint color is called Shipwreck. While we are talking about paint I also painted the walls. I had them color match Benjamin Moore’s White Dove. I went wit Behr Marquee because I didn’t pay attention after purchasing the sample it was the Behr Marquee. It worked great. I only needed one coat of paint on the walls with it. It is called White Dove for the Behr Marquee. 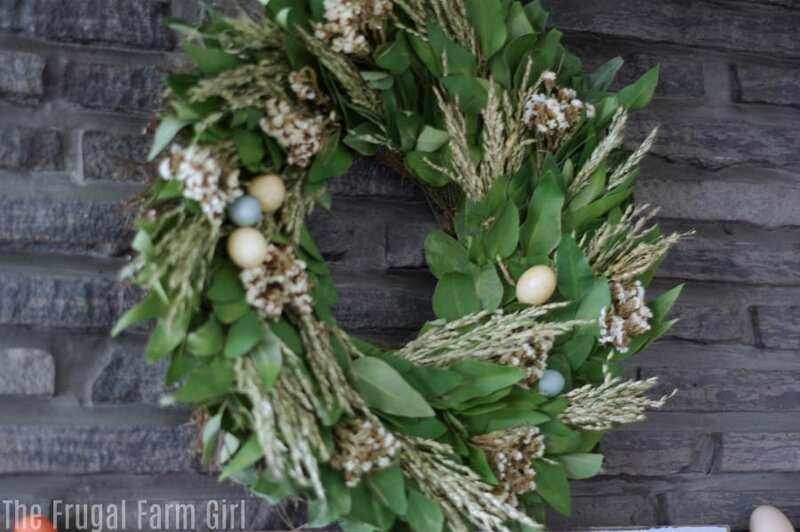 It’s one of the popular farmhouse white colors you see on Pinterest. I sanded the surface of every cabinet. It helps to label each cabinet as you are going so you know the original spot. 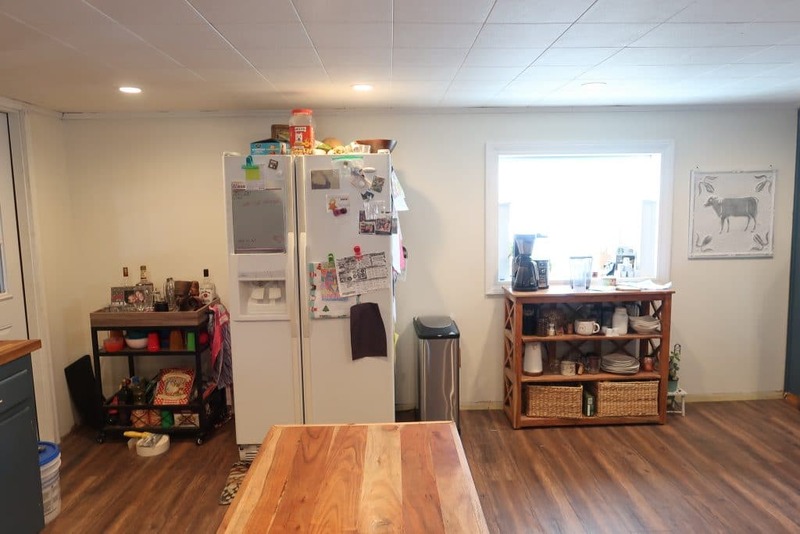 This was important for ours because they built the cabinets into the crooked floor. We didn’t get new cabinets so there will still be the quirks of a little-crooked door here and there, but it doesn’t bother me. We didn’t go into debt for this, and we still have pets, kids, and life happening all day every day in the kitchen. When you do a big kitchen project with animals and kids to tend to, you will have messes like this. I started this project in March so I had to let the cabinets dry in the basement with a fan on. 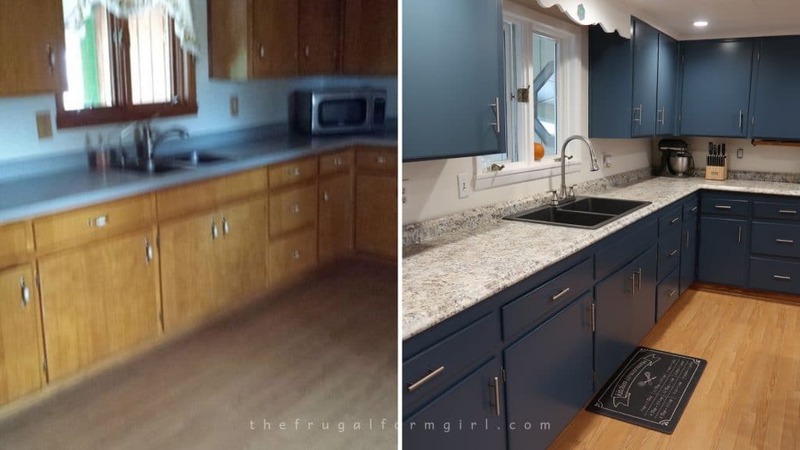 We replaced the painted over countertops. I’m not sure how many layers it had but it was chipping all over. We went with the standard in stock laminate countertop available at Home Depot. 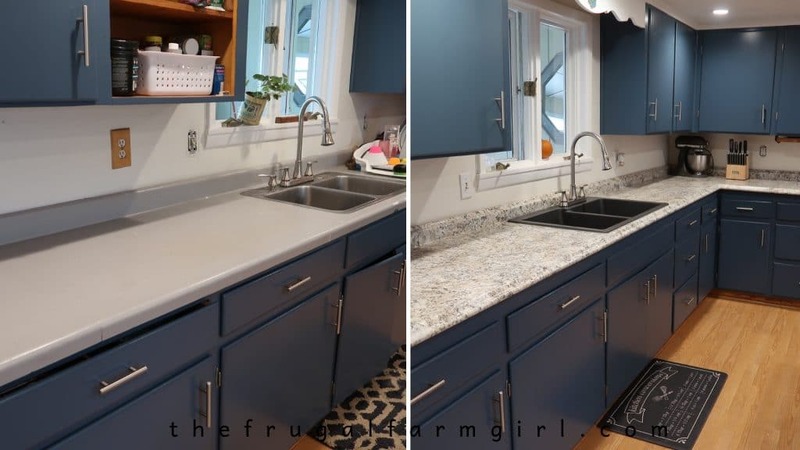 I didn’t see a point in paying for an expensive countertop material when we were just painting our cabinets. You will pay three times as much if you order laminate custom counter tops. 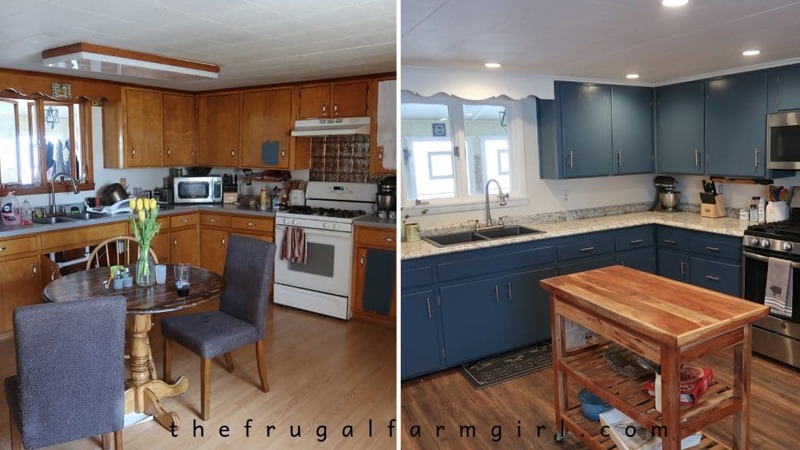 I loved in our first home there was a section of butcher block as the counter top. 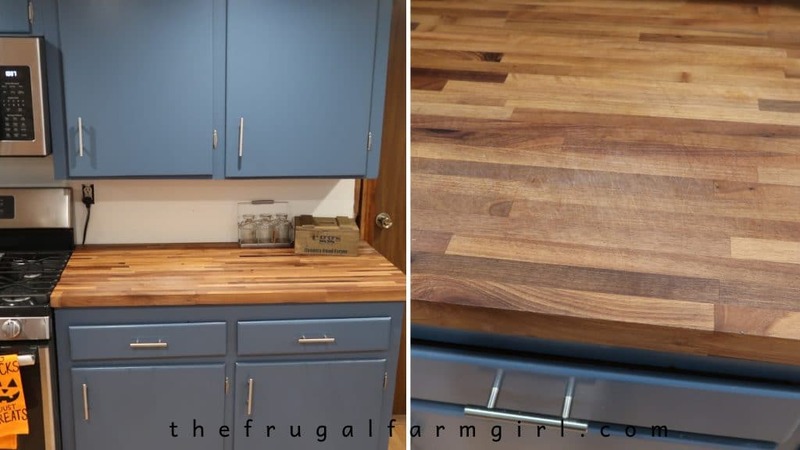 It is a perfect spot to have as your cutting board/prep area in the kitchen. 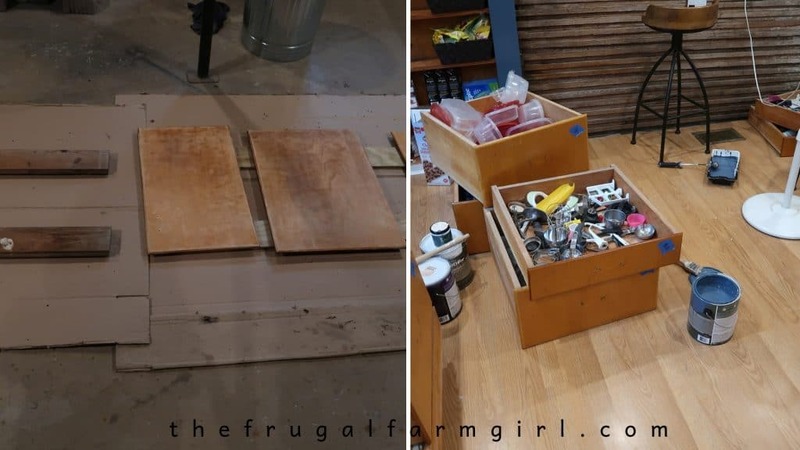 I spent hours searching online for an affordable kitchen island. They aren’t cheap. I felt a little hopeless and knew I wouldn’t be splurging for the huge island with a section for meal prep on it. I chose to go with butcherblock for the end of the counter. It isn’t choice for everyone but for me, it’s what I needed. I did splurge on a new stove and microwave. This sink was gross. A new one was a must. I opted for the slate look and almost considered the slate appliances too. I knew I didn’t want another stainless steel sink. 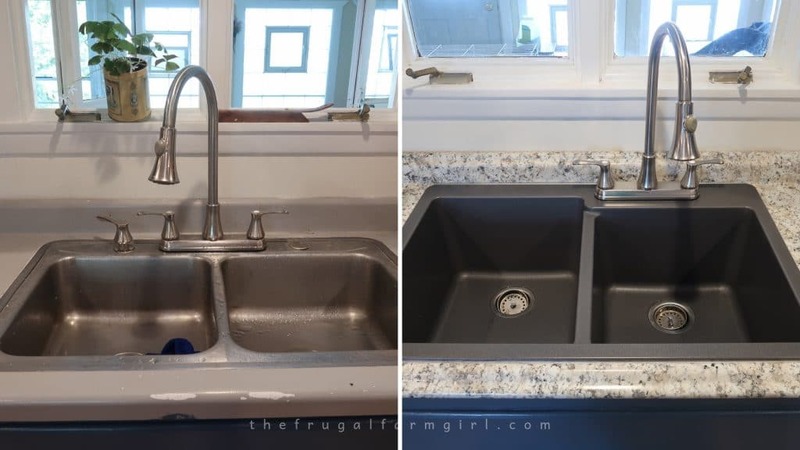 I also didn’t think I wanted the white farmhouse sink either. I spray painted all of the hardware for the cabinets. These were expensive and I wasn’t about to spend $3 or $4 per piece. We have a lot of cupboards. 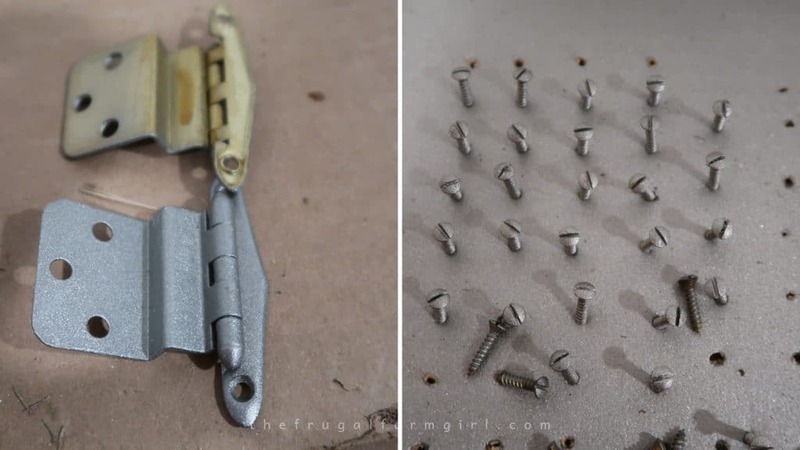 I put all the screws and hardware on cardboard and spray painted them in the garage. It was easy to do. I used a ___ spray paint from Home Depot. The pulls I scored a major deal at Home Depot on half. I knew these were the ones I wanted from my magazine inspiration. Low and behold on a hang tag at Home depot were two damaged plastic boxes of brushed nickel pulls. The ones I wanted were stainless steel and I had already bought a package. There are decent deals on Amazon for these bar pulls here. These ended up going on the drawers because they are slightly smaller. The good news is they were half the price of the stainless steel. You can’t tell the difference at all. The flooring was one of the last things we did. This kitchen still isn’t completely done. We are working on the stacked wall and turning barn wood into a bar area. 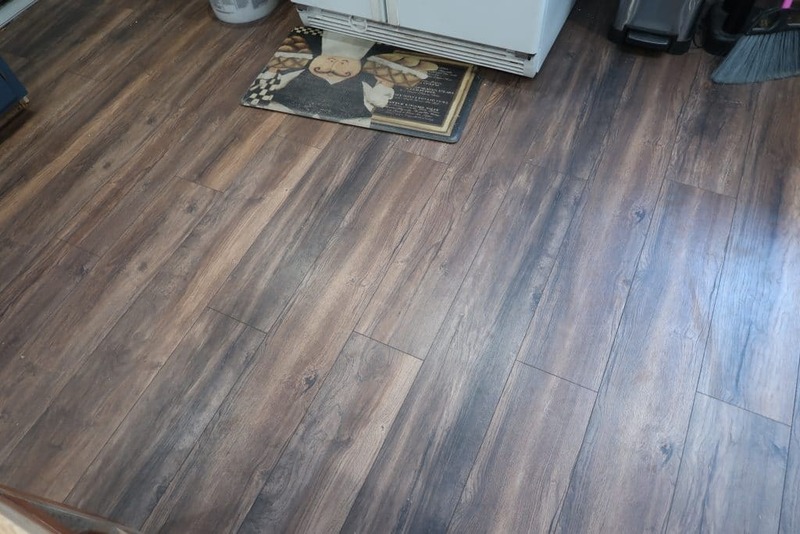 I originally wanted the same flooring we put into the office. In our farmhouse, we put in new flooring upstairs and in my office. it wasn’t available anymore so I brought home 10 different flooring pieces. I always go by price. I don’t even look at the Pergo brand because I know we are not paying for it. Eric pushed me to go a little darker in the flooring. I wasn’t too sold on it. I love the look of the wider planks. This was a better brand and on sale for $1.99 sq/ ft. Normally it was $2.89 sq. ft.
We decided to replace our entire downstairs flooring so it would match throughout. The price of this one on sale saved us $700 if I was to choose one not on sale. I was all for it. It sealed the deal for me. When we went to order the flooring the tag was on the wrong spot. We pushed for them to give us the price and they did! Honestly, the frugal girl I am, I probably wouldn’t have gotten that one if it wasn’t that price. I would have continued to look and find a cheaper one. It’s in the blood guys, I can’t help it. I love the flooring. It looks better in person than I had envisioned. It completes the look over the yellow tone flooring before. After removing the big cabinet I moved the fridge over away from the window. It helped the window catch your attention. I did end up buying a new stove and microwave. A new fridge, well this one is a great size and still works. It’s not standing out too terribly so I’m sticking with it. This wall arrangement still isn’t my absolute favorite, so I’m open to suggestions. Yet, it looks a lot better than it was. I wish this kitchen was completely done, but this is the way it goes when you do multiple projects yourself at a time. We still need to add a piece of barnwood to this wall for a bar. Not sure if I will white wash the stacked wall on top to brighten it up or what. I love our new kitchen. The color works and I’m so glad I decided to tackle something I’ve never done before. I love learning new things and taking on new challenges. The best part is when they turn out better than you imagined. This is one of those. My second favorite part is it’s all paid for. We aren’t making monthly payments on it. No need to have any guilt or what not because it’s been bought and paid. 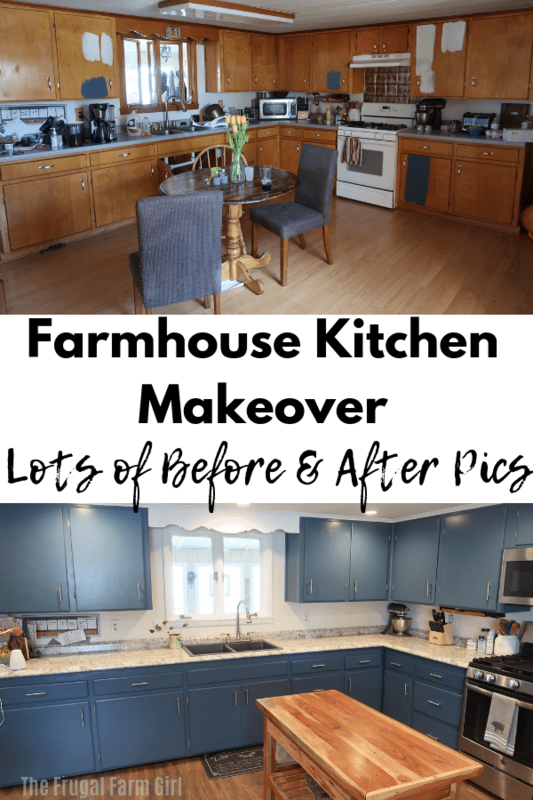 If you want a new kitchen I encourage you to try to update it your self. 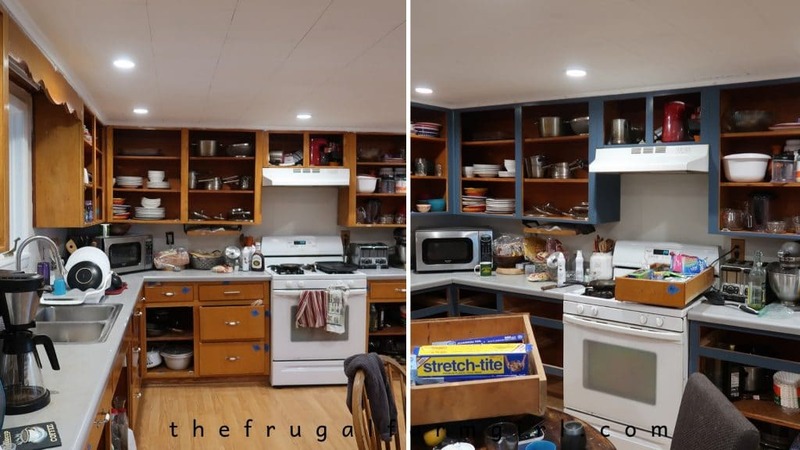 If you can avoid buying new cabinets and paying someone you will save a lot of money. Very very very nice . Great job. Love it. You are a brave woman. 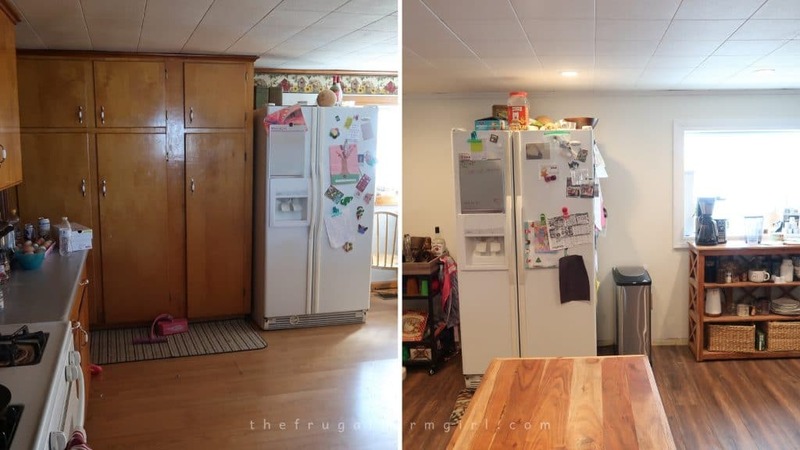 I know people who would totally freak if their kitchen was the least little bit disturbed. I love renovation and demo is my favorite part. Putting it all back together is the hardest for me. Bravo to you! Yes! Very brave to take on such a huge project but it turned out wonderfully. I absolutely love it! I love it! 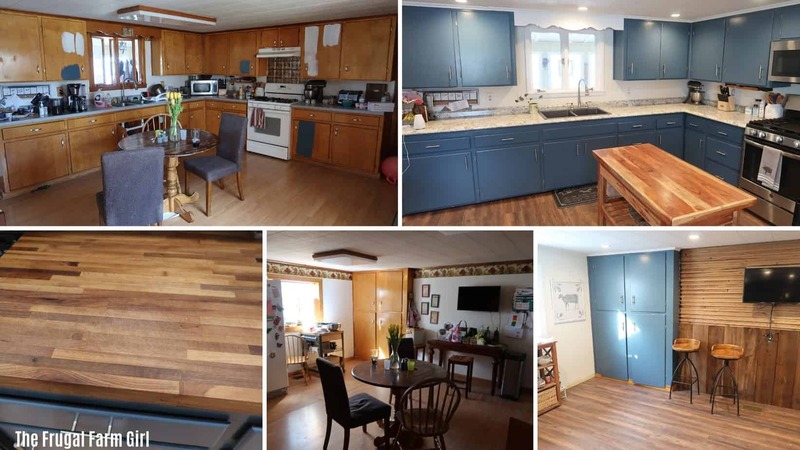 We have been looking into updating our kitchen bc the color scheme is just all over the place right now. Thanks! You should go for it! Well worth the risk. Beautiful work God bless you and your family, can we have an idea of what this Reno costed you? HI Maria! 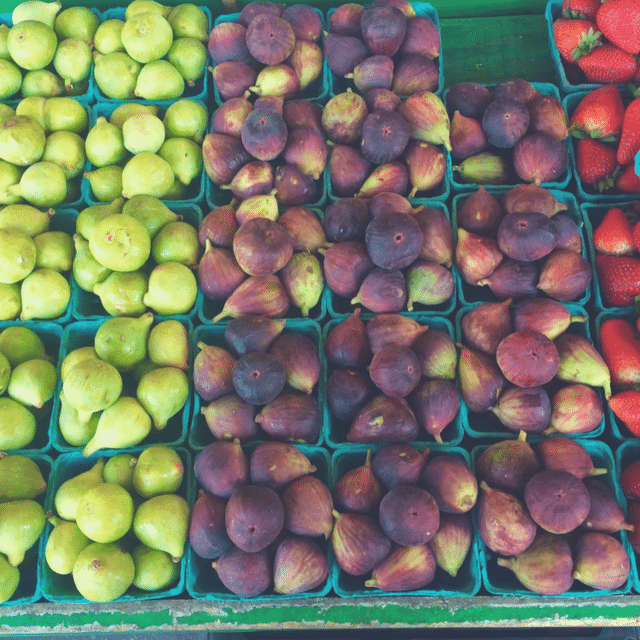 Yes, I’m actually working on a separate post breaking down the entire cost and all that jazz! Beautiful kitchen. 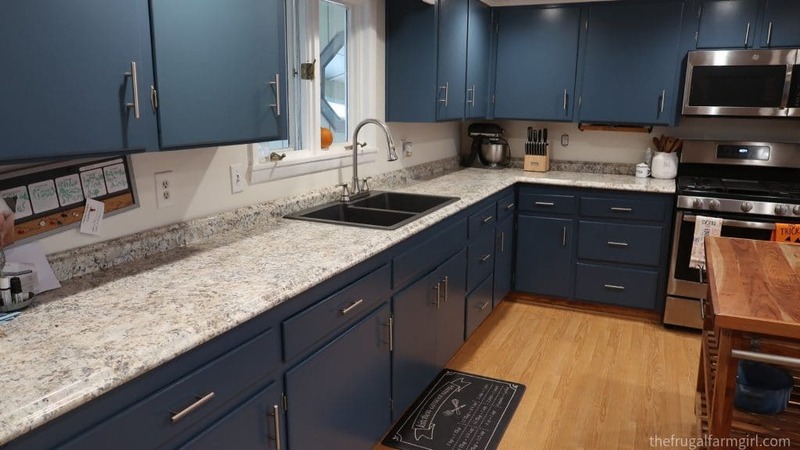 I really like the blue cabinets. It makes a nice contrast with the walls but remains. easy on the eyes. Great job, i noticed the window was what looked brown but is now white, did you replace the window? I am getting ready this spring to paint out cabinets but my one issue is i have wood tone vinyl windows, yuck! Nope we painted the window. It’s all wood around the windows on the inside. That is a bummer, it may not look that bad!